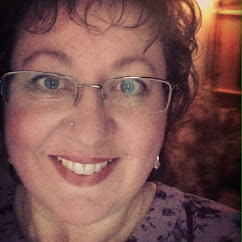 Edain Duguay: The Most Wonderful Time Of The Year! My favourite time is fast approaching, I love everything to do with this season, from Yule trees to Carol singers, from the smell of cinnamon to the excitement on children's faces. 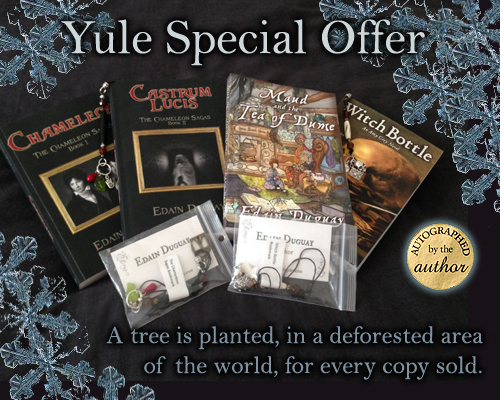 I just love Yule and, once again, I'm running my Yule Special Offer just for you! Great Gifts For All The Family! Save 25% (on R.R.P.) and get the Yule Special ~ Four Book Gift Collection for only $45.00! (+ p&p).This very special offer also includes two series themed, exclusive handmade bookmarks. Maud and the Tea of Dume (All Ages) ~ Book 1 of Magic, Tea & Witches. With a swish of magic, a smattering of luck and an ingenious brain, Maud endeavours to solve three mysteries. However, what will happen to the magical world and its varied inhabitants, if she fails? ‘Tis a horror too terrible to contemplate, without copious amounts of tea, of course. Castrum Lucis (YA/Adult) ~ Book 2 of The Chameleon Sagas. Kate is learning to use her new powers, she must hide the frightening truth from the entire human world. Chameleons try to change their secret society and the human world…forever. The lives of all hang in the balance until the long lost voice of The Hermit is heard from deep within the ancient, hidden world of the Chameleons. Chameleon (YA/Adult) ~ Book 1 of The Chameleon Sagas. A supernatural mystery about an ancient, secret society masquerading as humans. Man is not at the top of the food chain and hasn't been for a very long time. 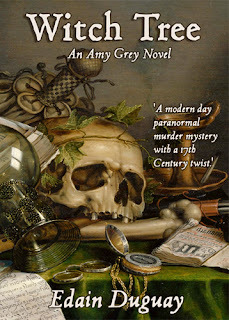 Witch Bottle (Adult) ~ Book 1 of The Amy Grey Novels. A modern day paranormal murder mystery with a 17th-century twist. You can’t choose the members of your family, not even the dead ones. *If you wish for your order to be signed by the author, please fill in the question boxes. Remember to include all four names required and put them next to the correct title! This offer only runs until 12 noon, Sunday 18th December and then it's gone again for a whole year, so I hope you get my books at this great price while you can.